When it comes to living roofs in subtropical climates, there are many members of the family Aizoaceae that are a good choice. In this family, you can find low-maintenance and drought-tolerant plants that use crassulaceae acid metabolism (CAM). The CAM makes it possible for the plant to keep its stomata (pores) closed during the warm and sunny day. During the night, the stomata are opened so that carbon-dioxide can enter. This carbon-dioxide is converted into organic acids, and these acids will then release carbon-dioxide again during the day, when the gas is required for the Calvin Cycle within the plant. The family Aizoaceae family contains 135 genera and approximately 1800 species. 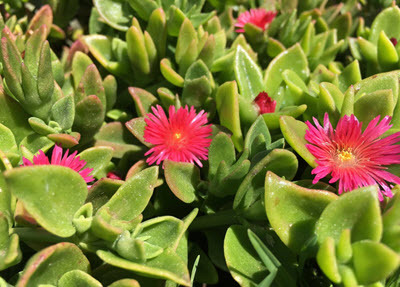 Many of the members are known as ice plants, due to their particular appearance. There are also some species, such as Mesembryanthemum guerichianum, that are so extremely adapted to storing water that they resemble round stones rather than typical plants. Aizoaceae is often used for living roofs, especially when low-maintenance and drought-tolerant plants are required. In the early 20th century, large amounts of Carpobrotus edulis was planted along railroad tracks in California, United States to stabilize the soil. In dry parts of the United States, fire-resistant Aizoaceae plants are used to create firebreaks to decrease the risk of wildfires spreading. Members of the genus Lithops are popular houseplant since they have an odd stone-like appearance. Some Aizoaceae species are edible and can be an interesting choice for those looking to create a green roof that will also produce some food. The Highway Ice Plant has edible fruits and leaves, the Crystalline Ice Plant has edible leaves, and the New Zealand Spinach is not a spinach at all but can be used as if it were. The natural habitat of the New Zealand Spinach is shorelines and bluffs, so this pant is very good at handling salt, e.g. on a living roof subjected to salt spray. Almost all the Aizoaceae species are endemic to Southern Africa where the inhabit arid and semiarid habitats in the Succulent Karoo, a desert ecoregion of South Africa and Namibia. Most species are herbaceous, but some of them can get a bit woody. The stems are either erect or prostrate. It is common for Aizoaceae species to rapidly shoot out their seeds when the seed cell is touched by water. This is known as hygrochasy, a splitting along a built-in line of weakness in a plant structure that occurs upon wetting in order to release its contents.